Most people with asthma use an inhaler to take their medicines. The correct answer is true. When people with asthma use an inhaler, they breathe in their medicine. The medicines go directly to their airways. Asthma medicines also come as pills or liquid. Your doctor will help you find the right medicine for you and the best way to take it. What are the main types of inhalers? The correct answer is all of the above. Not all inhalers are used the same way. Follow the directions and ask your pharmacist if you have questions about them. 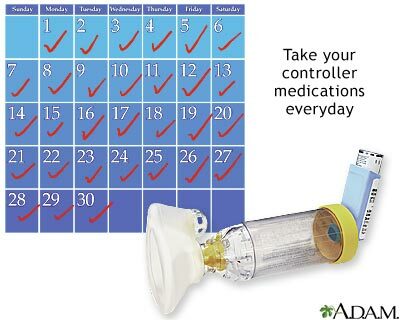 Bring your inhaler to your medical appointments so your doctor can make sure you are using it correctly. The correct answer is yes. Children can use an inhaler – and they should have a spacer for it. The spacer tube helps them get the medicine into their lungs properly. A nebulizer is another option, especially for younger children. This machine turns asthma medicine into a mist children can breathe in. Which of the following statements about spacers is NOT true? The correct answer is you should always use a spacer with a dry powder inhaler. You do not need a spacer when using a dry powder inhaler. But a spacer makes it easier to use an MDI. Some inhaled medicines can irritate the mouth and throat. A spacer can help because it enables more medicine to get to your airways. Inhaled steroids are usually the first choice for what type of asthma treatment? The correct answer is long-term control. Inhaled steroids prevent asthma symptoms by reducing airway swelling. They're preferred medicines because they are safe and work well. The best way to manage your asthma is to take your long-term control drugs every day, even when you feel good. Are inhaled steroids safe for children? The correct answer is A Yes. Inhaled steroids can slow a child's growth a small amount in the first months of use, but this is uncommon. Having asthma that is not controlled can also slow growth. Talk with your doctor about what's best for you or your child. It's a good idea to do this after using your MDI. The correct answer is rinse your mouth. This can also help reduce the chance of side effects -- such as throat and mouth irritation -- from your medicine. Rinse your mouth with water, gargle, and spit the water out. Your MDI needs regular cleaning. The correct answer is true. Cleaning your inhaler will help keep it working right. Remove the metal canister from the mouthpiece. Rinse the mouthpiece and cap in warm water and let dry. Place the canister back inside, and put the cap on. Is there a way to know when I'll need to refill my control medicine? The correct answer is yes. Divide the number of puffs listed on your canister by the number of puffs you take each day. This is how many days your canister will last. Write the date you need to replace it on the canister so you'll know when to get more. How should I store my MDI? The correct answer is at room temperature. Your MDI may not work well if it is too cold. Also, the medicine in the canister is under pressure, so don't let it get too hot or poke a hole in it. Keep your inhaler in a place that's easy to remember, so you'll always have it when you need it.